Ascribed to Ancient Egyptians and Chi nese — Communicated by Egyptians to Babylonians and Hebrews—Unknown to Ancient Greeks and Romans—Arabians distilled aromatic waters in remote times —"Alcohol" an Arabic term—Old Stills in Ceylon and Pacific Islands—Art introduced into Europe by Moors, 1150— "Aqua Vitæ" found in Ireland, 1170— Derivation of "Uisge-beatha " and Whisky-—Virtues claimed for Irish Whisky. No reference in early writings—Little reference in Gaelic poetry and literature— Ale and Mead—Juice of Birch Trees— Liquor from heather—Whisky mentioned in Statutes of lcolmkill, 1609—Ale, Wine and Brandy more used than Whisky— Statutes against importation, etc., of Wine, 1616-1622—Repressive measures lead to increased distillation of Whisky—Excise duty first laid on Whisky in 1660—Rates of duty and quantities charged—"Ancient Brewary of Aquavity" at Ferintosh—Privileges to proprietor in 1690—Withdrawal of privileges in 1784—Burns on loss of privileges—Minister of Dingwall on withdrawal —William Ross on virtues of Ferintosh Whisky. 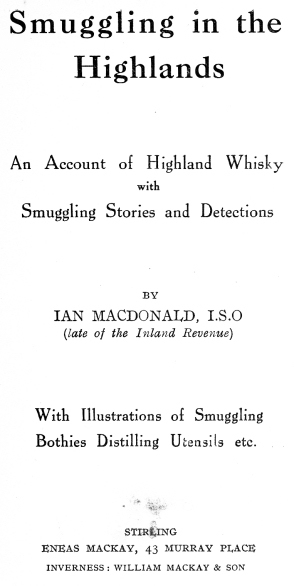 Old practice of distilling in homes—Old permission to brew Ale—Farming out of duties while low—High duties and injudicious restrictions—Collection of increased duties by Excise Officers—Boundary fixed between Highlands and Lowlands—Licence on contents of Stills—Leads to sharp practices and inferior Whisky—Smugglers' Whisky superior in flavour and quality— Prohibition to use small Stills—Complaints and discontent—Graphic picture by Robert Burns—Highland Authorities appeal to Government—Duties reduced and regulations modified—Smuggling prosecutions number 14,000 in 1823—Military and Revenue Cutters employed. Lawlessness, daring and cunning—"Good, pious men" as Smugglers — Alasdair Hutcheson of Kiltarlity—John Dearg of Kiltearn—An artful Abriachan woman— Sandy MacGruar and the Artist—West Coast Smuggler in Dingwall jail—Large seizure in Auchanalt Deer Forest—Melvaig and Loch Druing Smugglers—Inverasdale Smugglers disturbed—Alligin and Diabaig Smugglers—Tarvie and Garve Smugglers— Nigg Smugglers hide Still under pulpit— Glen Urquhart Millers outwit Officers— Foulis Smuggler and daughter baffle Officer — Smuggler's coolness: a neat story—Glen Urquhart bull at a bothy—Glen Urquhart Castle and Castle Gloom, Dollar—Cunning and daring of Smugglers. Considered a very venial offence—Old custom of making home-brewed Ale—Old permission to distil in homes—Whisky distilled from produce of own land—Evil influence of Ferintosh privilege—Distinction between English Statute and Divine laws —No love or respect for English Government — Resentment against injudicious regulations — Smuggled Whisky superior and popular—Circumstances reversed now —Distillers' produce best and matured Whisky — Smugglers use rude utensils, work by rule of thumb in terror and hurry. Result: coarse, inferior Whisky. Causes demoralization, destitution, and recklessness—Families, houses and crofts neglected — Moral and physical stamina impaired—A curse to the individual and community—Decrease in Smuggling since 1823—Causes of improvement—Spread of Education Influences of Landlords and Clergy—Enforced idleness and poverty —Long, severe winters in wild, remote localities—Natural craving for excitement or profit—Evil example of persons not driven by poverty—Responsibility of purchaser of smuggled Whisky—Legitimate trader and Revenue suffer—Success causes envy and jealousy—Distrust and suspicion among neighbours —Revival of smuggling after Abolition of Malt Tax—Probable effect of Security of Tenure under Crofters' Act—Duty of all interested in material, physical and moral welfare of Highland people.